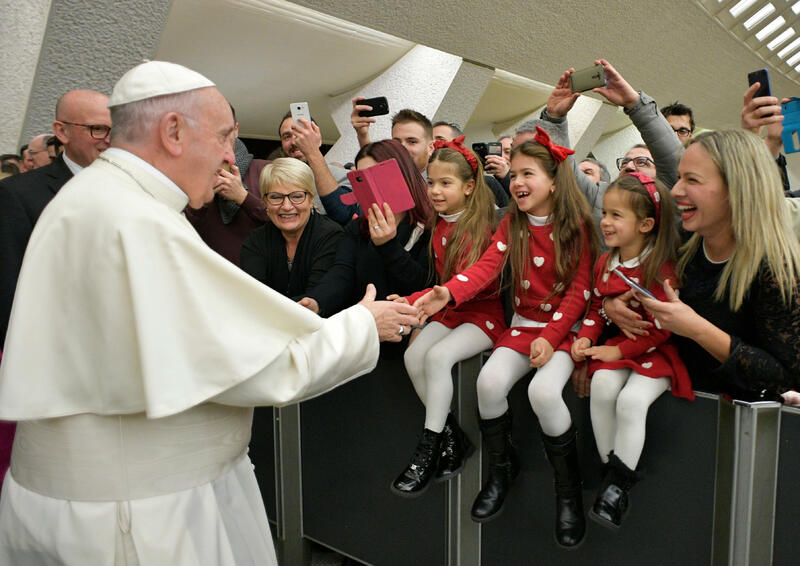 At midday Thursday, Dec. 21, 2017 the Holy Father Francis met in Paul VI Hall with dependents of the Holy See and of Vatican City State, with their respective families, for Christmas greetings. Here is a ZENIT translation of the Pope’s address to those present at the Audience. Good morning! First of all I want to thank, to thank each one of you for the work you do inside here. Each one has his work, knows it . . . There are also work teams in the Vatican . . . This work is what makes this “train” function, which is the Vatican, the Holy See, which seems so heavy, so great, with so many problems, so many things . . . And each one of you gives his best to do this work. I am conscious that without your work . . . one of you was telling me that he has worked here for 43 years — how many memories! – without your work , things wouldn’t go well, and this means that the work of the Church wouldn’t go well; so much work couldn’t be done for the preaching of the Gospel, to help so many people, the sick, the schools, so many things . . . You are part of this “chain” that carries forward the Church’s work. The first word I would like to say to you is work, but not to say to you: work more; get on with it! No, no, to say thank you. Thank you. However, there is a problem when speaking of work in the Vatican. One of you ladies came in and pointing to a youth said: “Help the temporary workers.” The other day I had a meeting with Cardinal Marx, who is the President of the Council of the Economy, and with Monsignor Ferme, the Secretary, and I said: ”I don’t want illegal work in the Vatican.” I apologize if this still exists. The famous article 11, which is a valid article for a test, but a test of one or two years, not more. Just as I’ve said that no one must be left without work, that is, fire one, unless there is another job outside for his convenience, or that there is an agreement that is suitable for the person, so I say: we must work inside here so that there is no temporary work or workers. It’s also a problem of conscience for me, because we can’ teach the Social Doctrine of the Church and then do these things that aren’t right. It’s understood that a person must be tested for a certain time, tested for a year, perhaps two, but stop there – nothing illegal. This is my intention; you help me. Help also the superiors, those that depend on the Governorate, the Cardinal, the Secretary, help to solve these problems of the Holy See: temporary jobs that still exist. Hence, the first word is work, to thank, talk of temporary work and also, one last thing: work is your path of holiness, of happiness, of growth. Today perhaps the worst curse is not to have work. And so many people — you surely must know so many –, don’t have work. Because work gives us dignity, and the security of work gives us dignity. I don’t want to give names, but you will find it in the newspapers. Today I saw, in a newspaper, these two problems, of two important firms, here in Italy, which are at risk, and to save the life, one must “rationalize” – that’s the word – the work and fire 3-4 thousand people. This is awful, very awful, because dignity is lost. And this is a problem not only here, of the Vatican, of Italy or of Europe: it’s a global problem. It’s a problem that depends on many factors in the world. To keep one’s work and to have dignity, to take the bread home: “I take it because I earn it. Not because I pass by Caritas to get it, no. I earn it.” This is dignity. So is work. Thank you, Help superiors to put an end to irregular work situations, and keep your job because it’s your dignity. I would say, keep your job, but do it well. This is important! The second word that comes to mind to say to you is: family. I would like to say to you sincerely: when I know that one of your families is in crisis, that there are children who are anguished because they see that the family has . . . a problem, I suffer. But allow yourselves to be helped. I wanted the Secretary General of the Governorate to be Bishop so that he would have this pastoral dimension. Please, save the families. I know it’s not easy, that there are personality problems, psychological problems, problems . . . so many problems in a marriage. However, try to ask for help in time, to safeguard the families. I know that among you there are some who are separated; I know it and I suffer, I suffer with you . . . life has gone that way. However, I would also like to help you in this; allow yourselves to be helped. If something has happened, at least don’t let the children suffer, because when parents quarrel, the children suffer, they suffer. And I’ll give you some advice: never quarrel in front of the children –never, because they don’t understand. Take care of the family. And for this you have here Monsignor Verges and also the chaplains. They will tell you where to go to get help. The family: this is the great jewel, because God has created us family. Marriage is the image of God, man and woman, fruitful: “multiply,” have children; go ahead. I was happy today when I saw many, many children here. It’s a family. Take care of the family, is the second word that comes to mind. The third word that comes to mind – perhaps one of you would like to say to me: “But put and end to it with this!” is a recurrent word: gossip. Perhaps I’m mistaken . . . there is no gossiping in the Vatican . . . perhaps, I don’t know . . . One of you said to me, one of you workers, one day when I preached about gossip, and he had come to Mass with his wife, he said to me: “Father, if one doesn’t gossip in the Vatican, one remains isolated.” Heavy, heavy! You heard what I say about gossiping: the gossiper is a terrorist, because he does as the terrorists: he throws the bomb, goes away, the bomb explodes and hurts so many others, with the tongue, does that bomb. Please, don’t engage in terrorism! Don’t engage in the terrorism of gossip. This is the third word that comes to me. However, someone might say to me: “Father, give us advice, what can we do not to gossip? ”Bite your tongue! It will surely swell, but you will have done good not to gossip. Gossip, also, by some persons who should give example and don’t, they don’t give it. And here <is> the fourth word I would like to say to you: forgiveness. “Forgiveness and “sorry,” because we don’t always give good example; we – I speak of the “clerical fauna” – we [he smiles] don’t always give good example. There are mistakes in life that we clerics make, sins, injustices, or sometimes we treat people badly, <are> somewhat neurotic, injustices . . . Forgiveness for all these bad examples. We must ask for forgiveness I also ask for forgiveness, because sometimes “I fly off the handle’ [he laughs] [I lose my patience] . . .
Dear collaborators, brothers and sisters. Here are the words, the four words that came from my heart: work, family, gossip, forgiveness. And the last word is the Christmas greeting: Happy Christmas! — but a Happy Christmas in the heart, in the family, also in the conscience. Don’t be afraid, you too, to ask for forgiveness if your conscience reproaches you something; look for a good confessor and do a thorough cleaning! They say the best confessor is the deaf priest [he laughs]: he doesn’t make you feel ashamed! However, without <their> being deaf, there are so many merciful <confessors>, so many who listen to you and forgive you: “Go ahead!” Christmas is a good opportunity to make peace also within ourselves. We are all sinners, all. Yesterday I made my Christmas confession: the confessor came . . . and it did me good. We must all go to confession. I wish you a Happy Christmas, of joy but that joy that comes from within. And I don’t want to forget the sick, who perhaps are in your family, who suffer, and I send them also a blessing. Thank you so much. We guard work, so that it’s just; we take care of the family, we curb the tongue and, please, forgive us for the bad examples, and let’s do a thorough cleansing of the heart this Christmas, to be in peace and happy. And before I go, I would like to give you a Blessing, to you, to your families, to all. Thank you so much for your help. [Blessing] And pray for me; don’t forget!